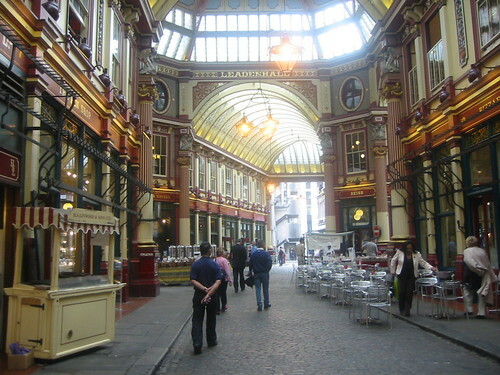 the winning read is set in Reading! That’s ok, I like how inclusive it is – you don’t have to be single to take part, anyone who has a book they love can join in, that’s great! 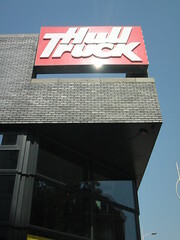 Unfortunately they hadn’t received my online sign-up and now the popular event was fully booked. I’d been excluded. Laura was very apologetic. Can you put me on a waiting list incase someone drops out? Read dating, like speed dating but with literary attitude! 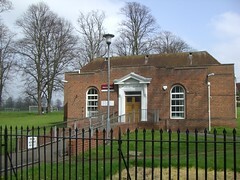 Reading Library presents a fun and friendly evening where you can share you reading passions with like-minded people. Come ready to enthuse about your favourite read 1:1. You will have just a couple of minutes to woo readers to your book. Prize for the reader whose book scores the most “dates”. Cinderalla you shall go to the ball (Library)! I’ve phoned round everyone that signed up and found a person that can’t come, so there is a place for you. Can I take your library card number? Reading Library staff’s humanity humility and imagination – you can get some without a prescription, it’s FREE! can you guess the logic behind the juxtapositions? 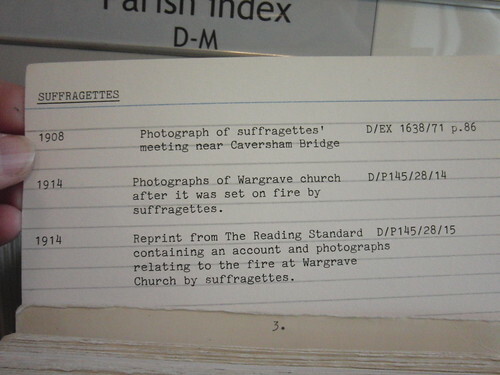 I discovered a fabulous events list while I was exploring Reading Borough Library service’s website. But it was a non-interactive web page, I’d have to keep coming back to the web page to look for new events and changes in events. 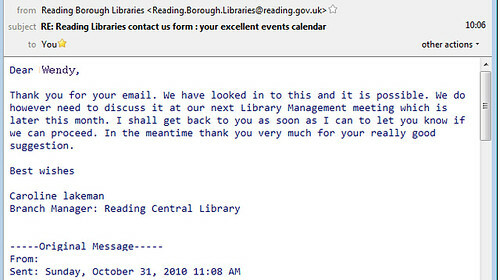 Being unable to resist the opportunity to share the wisdom of my knowledge about blogging and RSS I wrote to them suggesting that they consider changing the format of their events calendar to a blog so that people could subscribe. The response was quick, personal and positive, very impressive. Several pubs I’ve visited recently have bookshelves labeled ‘book exchange’. 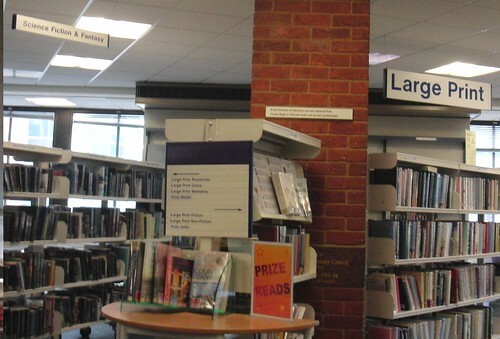 Unlike a library, you do not get a wide range of choice, helpful advice, and an occassional dose of ‘shushing’. This can be a bonus for noisey, decisionally-challenged, me. 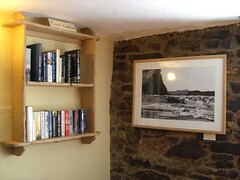 Until now I’d treated the bookshelves of friends and family as book exchanges, now my net has widened to include pubs…. …some people are releasing their books into the wild then remotely tracking their progress via websites like bookcrossing. HIF: Did you enjoy your holiday in Italy? HIF: are you all fresco’d out? 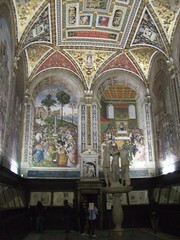 The Piccolomini library in Siena was outstanding, fabulous books, floor tiles, wall frescos, ceiling frescos, quiet ambience, excellent lighting and virtually no other visitors. 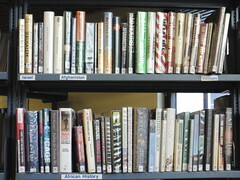 The Victora and Albert Library is a living piece of history. 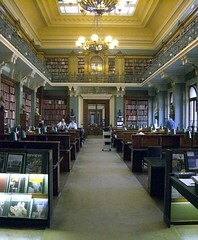 A free piblic library where the resources themselves are artefacts of beauty. When dailight fought it’s way into my room I rolled out of bed, discovered that there was no hot water and washed sparingly in the cold. Wrapped up warm. Put on my head-torch, manually opened the garage drove the car out, manually closed then locked it. I skipped breakfast and tea thinking that I coulkd get that at the works canteen. Drove to work. Driving when the power is completely out for a city is fascinating. It works extremely well with the US 4-way stop system everyone knows what to do, it may be slow, but its systematic, rule-based fairness. The UK would probably rely on politeness and individual based sense of fairness, which in th UK would probably work and be a bit faster than a 4-way stop. When I got to work, it too was powerless. Just some emergency generators and bewildered employees. I sorted a few ‘what to do’ type things and looked at some colleagues impressive photographs of their Journey into work, over and around fallen trees in 4-wheel-drive monsters. Cold, hungry and completely TEA-LESS, I followed a rumour that there was power in the nearby city of Bellevue. 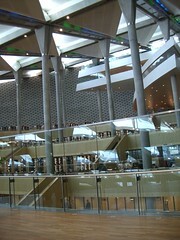 I spent nearly 2 hours travelling to Bellevue main library. That’s where I am now. Warm, cosey, laptop powered-up and online. Still tea-less. I left my wallet in the Wendy House. buy a non-mains-powered way of boiling water to ensure I have Tea during subsequent storms. a non-mains-powered radio so that I can listen to the news. Fabulous public librarys and internet access remove the ‘need’ to own many books. Despite this lack of ‘need’ it is very painful to let books leave. I haven’t managed to release my 16th Birthday present from my brother – The Concise Oxford English Dictionary. What books would you have difficulty releasing?